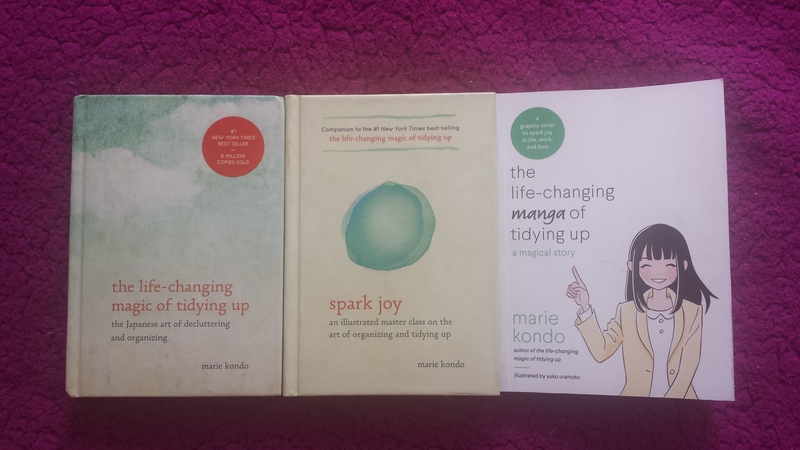 I was recently introduced to the books of tidying expert/guru Marie Kondo (KonMari), and as soon as I read the brief excerpts on her website, I knew I needed these books in my life ASAP. Being somewhat of a dejunking/organization nerd myself, the joy I felt inside of me as I looked over her website was almost overwhelming. I wanted to laugh and cry at the same time. I knew I had just found something wonderfully life-changing. The basic idea of the KonMari method is to only keep possessions which bring you joy, and to surround yourself with them. Doing so dramatically and positively affects all areas of your life, as your possessions and surroundings will then help you to live the life you truly desire. I began by reading The Life Changing Magic of Tidying Up, and ate it up like a piece of chocolate cake (you guys, I loooove chocolate cake). I read it straight through in one afternoon/evening, and during small breaks I talked my husband’s ear off about the different concepts. The next day I started the follow-up book, Spark Joy: An Illustrated Master Class on the Art of Organizing and Tidying Up, and I read it over the course of three days instead of one (I do have a life, you know). This book offers more details and presents illustrated examples of folding clothes and other storage techniques. Finally, the graphic novel The Life Changing Manga of Tidying Up: A Magical Story showed up at my door and it was a cute and quick read that gave me many giggles (I love to giggle). For those who don’t like to read (especially non-fiction), this graphic novel of a fictional girl who employs Marie Kondo to help her tidy her home is a fun and easy way to learn the KonMari method. Although I’ve only just begun the KonMari tidying process, I have already experienced positive changes in my life by simply adjusting my mindset regarding the way I relate to my possessions. Her method of folding clothes has also revolutionized the way I relate with my clothes. I am so excited about this entire experience and can’t wait to finally get my house (life!) in order after all these years. Of course, I MUST blog about this. I plan to blog about my entire tidying process using the KonMari method (I’ve already learned so much!) because I can’t keep my mouth shut about the things that I love, and I also hope to inspire others. I really do believe this is life-changing, as the title of Kondo’s first book asserts. Soooo, my next several posts are going to be all about this “Spark Joy Journey”. I hope that by reading my forthcoming blog posts, you too will learn what sparks joy in your own life and experience a more fulfilling and happier way to live.